What is CETO La Reunion? 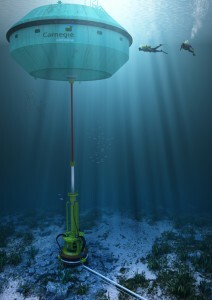 CETO La Reunion is a submerged point absorber technology invented, installed, and operated by Carnegie Wave Energy, an Australian developer (Carnegie Wave Energy 2011). The CETO La Reunion project is a three stage project, with the stage 1 currently operational as a 1 unit prototype (Carnegie Wave Energy 2015). Stage 2 of the project is a 2 MW array and stage 3 expands the array to 15 MW (Carnegie Wave Energy 2015). 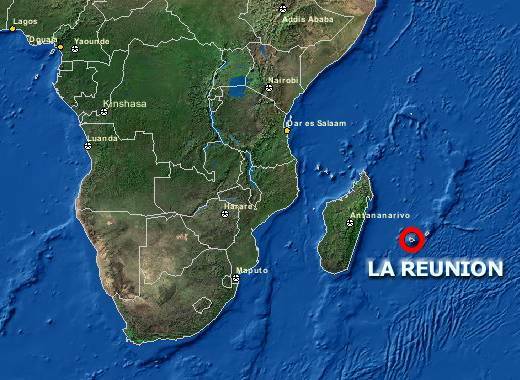 Reunion Island, off the coast of Madagascar, makes an ideal deep water test site for various prototypes. (EcoGeneration 2011). Reunion is also exposed periodically to high energy southern wave events, and larger, consistent waves lead to greater amounts of power generated (EcoGeneration 2011). The CETO units are installed in relatively shallow depths of 25-30 meters (ICOE 2010). This is relatively shallow when compared with other offshore wave energy technologies and this depth is even shallow when compared with other submerged point absorbers, which typically function at depths of 80-90 meters. The current stage 1 installation is about 8 kilometers off the coast of reunion, on the southwest side of the island. The stage 1 CETO unit is around 10 meters in diameter and acts as an anchored, submerged point absorber (Subsea World News 2013). 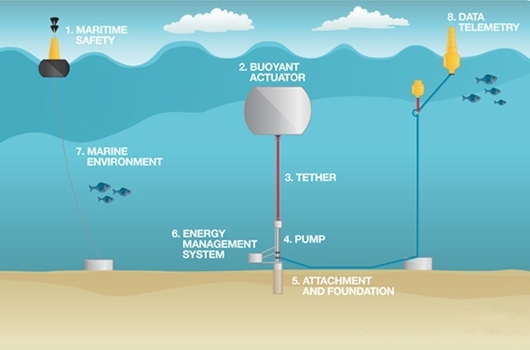 The buoy is tethered to pump units on the seabed and moves up and down on a spar with the movement of the waves (EcoGeneration 2011). This action drives the pumps which pressurize seawater that is delivered to the shore via underwater pipelines (EcoGeneration 2011). On shore, this pressurized water is run through turbines which generate electricity, much like a hydroelectric dam (EcoGeneration 2011). An additional feature of the CETO technology, however, is that the pressurized water can be used to supply a reverse osmosis desalinization plant (EcoGeneration 2011). In reverse osmosis, pressurized water is forced across a membrane in order to overcome the osmotic pressure of water. Using CETO units in desalinization would essentially replace the electrical pumps normally required to pressurize the water, meaning greater efficiency and lower costs for the expensive process (EcoGeneration 2011). Although it is not connected to the grid, CETO La Reunion has a power purchasing agreement under a French feed-in tariff of .22 euros per kilowatt hour (kWH) (EcoGeneration 2011). Stage 2 of the project, however, will be connected to the grid (EcoGeneration 2011). The project also received a grant of $5 million from the French government in order to finance stage 1, however, stages 2 and 3 are projected to be financially independent and profitable due the connection of the units to the grid (Carnegie Wave Energy 2015). In trials off the coast of Australia, the CETO system has acted like an artificial reef, attracting marine life rather than displacing it. An independent study showed that the amount of marine life increased from 7 to 27 species after deployment of the CETO unit (Carnegie Wave Energy 2015). There is minimal collision or strike risk with these units since they are not turbines and are fully enclosed, however, there is still risk of cable entanglement and operational noise with the CETO units (Week 3 Lectures). The full effects of these hazards are not fully known because the technology is relatively new. he installation of stage 1 of the project. The undersea infrastructure was ready to go, but the buoy installation was delayed due to missing the narrow window of good weather (Subsea World News 2013). This problem could be compounded in stage 2 of the project as multiple buoys must be installed in the same narrow weather window. Currently, there is no information on the production coming from the CETO unit installed off the coast of Reunion, however, the previous generation of CETO units produced 78 kw of energy and pressurized water up to 77 bar, well above the pressure necessary for reverse osmosis desalinization (Carnegie Wave Energy 2015). The future of the CETO units, however, could be in some doubt after a cyclone with 200 km winds swept away and damaged the CETO unit operating in Reunion by snapping one of the mooring cables (RenewEconomy 2014). According to Carnegie, the unit was modified from others in that it was installed without a quick release mechanism which would have prevented such an accident. (RenewEconomy 2014). Regardless, the company claims it is not discouraged and will continue to pursue stage 2 installation (RenewEconomy 2014). Overall, the CETO La Reunion project seems economically viable with little environmental impact. This technology could serve as a model for future wave energy projects. The fact that the point absorber is submerged takes away the controversy over NIMBY as far as aesthetics are concerned. It also helps protect the unit from the choppier more volatile waters at the surface. The environmental impact seems low: with no blades or open ducts to trap and ensnare marine life in, this unit seems less dangerous than an open axial turbine, for example. As far as the 2014 cyclone is concerned, the 200 km wind speeds recorded are atypical, even for Reunion, and I doubt any marine hydropower installation would be able to withstand those extreme conditions. The big draw with this technology, however, is the desalinization portion of it. Early testing in Australia of similar units made by the same company (Carnegie Wave Energy) indicate that these units are easily scaled up via an array format, they produce energy at a relatively high volume for marine power (78 kw per unit) and they are able to achieve more than enough pressure (77 bar) to power reverse osmosis desalinization (Carnegie Wave Energy 2015). Current desalinization processes, using electric pumps, are very expensive, and desalinization via a renewable generation system would cost even more. The prospect of emissions-free desalinization, however, is too good to not be pursued further, especially as global carbon emissions continue to rise and freshwater supplies dwindle. Overall, this is what makes the CETO technology worthy of further investment, any energy generation from the CETO units is just icing on the cake. “CETO 4 Manufactured and Delivered to Reunion Island.” Carnegie Wave Energy, 26 Sept. 2011. “EDF EN and DCNS Deploy CETO 4 Unit on La Réunion Island.” Subsea World News. Subsea World News, 2 Jan. 2013. Web. 8 July 2015. “FAQ.” Carnegie Wave Energy. Carnegie Wave Energy, n.d. Web. 8 July 2015. Gautret, Laurent, and Marion Corre Labat. “Reunion Island/Indian Ocean, a French Experimental Key Laboratory for Ocean Energy.” ICOE, 6 Oct. 2010. Web. 8 July 2015. Parkinson, Giles. “CETO Wave Energy Machine Swept Away in Cyclone, Report Says.” Renew Economy RSS. Renew Economy, 27 Jan. 2014. Web. 8 July 2015. “Réunion Island CETO Power Project — EcoGeneration.” EcoGeneration. EcoGeneration, Mar. 2011. Web. 8 July 2015.